Note: This functionality was integrated into the core as of concrete5.6.2. 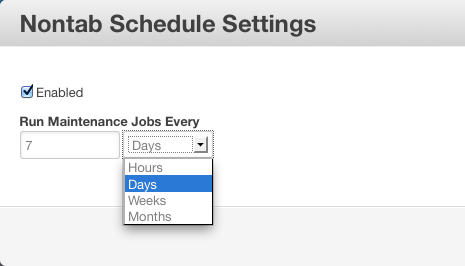 If you're running concrete5.6.2 or later, you can schedule jobs directly from the Automated Jobs page in the Dashboard. The nontab scheduler allows you to run concrete5's maintenance jobs without using crontab. Especially useful if your host doesn't support cron or if you are having trouble figuring out how to configure cron on your host. Supports simple scheduling to run your maintenance jobs every X hours, days, weeks or months. This addon is well suited for small sites where the execution of the maintenance jobs takes less than 30 seconds, for larger sites, or if you have trouble with your maintenance jobs completing, you should setup a real cron job to do the heavy lifting.